Why are these Axle Measurements so Important? Getting correct and accurate measurements off of your trailers current axle is crucial to ensure the proper replacement of your new axle. In most cases, getting the basic Hub Face and Spring Seat measurements currently yields a perfect replacement and the process flawless. However, in some cases trailers are designed to very tight specifications, meaning that the axle may have been made at the minimum length required to make sure the tires clear the frame. The Length of your trailers axle determines the location of your trailer tires. Therefore, if your axle is to short, it is possible for your tires to rub on the frame of your trailer. On the other end of the spectrum, sometimes the axle length is made to the maximum length. Axles have a range of safe operation that is determined by comparing the Leaf Spring Centers to the Hub Face of the Axle. Essentially this means that if the Hub Face is to close to the Spring Centers, the tires could rub on the frame, if the Hub Face is too far away, this creates unwanted leverage that could cause pre-mature damage to the axle beam. Picking an Axle length must be done in correlation to the Leaf Spring Center Measurement as well, to ensure your axle will fit and perform for many years down the road. Each Axle listing has the Safe Spring Center Ranges stated to prevent any issues. What other Components are needed when replacing my trailer axle? Typically when replacing your trailer axle it is due to either corrosion or impact damage. If this is due to the axle corroded as a result of saltwater or any other environment, in most cases much of your other hardware will also be rusted and in need of repair. Take a look at all the components that make up your trailers suspension system. When you go to do the replacement, you will more than likely be cutting off rusted components to replace your axle. While you are doing this process, this is the perfect time to replace associated parts of your trailers leaf spring axle system. Starting from the Frame of your Trailer and working down, take a look at your Leaf Spring Hangers. This component actually is responsible for holding your leaf spring, axle, and finally tires and wheels in place. This component is vital for the overall function of your trailer ,so if its condition is compromised, this is the best time to address it. These Spring Hangers can be welded directly to your trailers frame or bolted on depending upon the overall style of trailer that you have. We have replacements for both. Next, you will want to inspect all the Leaf Spring Mounting Bolts. Depending upon your style of leaf spring suspension and the number of axles on your trailer, the number of bolts in your axle set up is different. Look at all the bolts to determine if they are re-usable. As stated before, in many cases because of corrosion these will need to be cut or burned off. If they can be re-used, that's great! We have two main diameters of leaf spring bolts, 1/2 inch and 9/16 inch. Measure the thickness of your bolt while you are investigating the condition of them so when you come back you will be able to select the correct replacement. These are also available in stainless steel, to prevent any further issues or replacement in the future this is the ideal choice. Next, if you have a tandem axle trailer, which means two axles, check out your Trailer Equalizer Bars to ensure they are still in solid working condition. As their are several different sizes, measure the width and height of yours while you are looking to ensure the proper replacement. If you have a single axle trailer, you will not need this component. On both single axle and tandem axle trailers with Double Eye Leaf Springs, the presence of Trailer Leaf Spring Shackles on your trailers suspension is possible. The number of these needed changes from single to tandem axle trailer. Single axle trailers will have four total, and tandem axle trailers will have eight. If you have Slipper Springs or Reverse Curve (Open Eye) Style Leaf Springs, you will not have these Leaf Spring Shackles. The Next Component to take a look at would be the location where your leaf springs and your axle mount. This mounting would use one of these Leaf Spring U-Bolt Kits to connect your trailers axle with your Leaf Springs. You will absolutely be removing your current Axle Mounting Bolts where replacing your axle. therefore, if they are corroded cutting off is required, this is the time to replace them. Measure the width, inner diameter between the legs of the current U-Bolts, and the length of the U-Bolt leg, from inside to end of the U-Bolt. This will ensure you get the proper replacement Axle U-Bolt mounting Kit. These U-Bolts will either be Square or Round, depending upon your Axles Dimensions. Your replacement U-Bolt kit will be to either be square or round as well to match the axle you are purchasing. This Essentially Sums up the Suspension portion of replacing your trailers axle, inspecting all the components ahead of time ensures that when you go to do the project with all the tools laid out and your trailer is on jack stands, that you have everything you need. Now we will go through some other components that are commonly needed when doing this project. Also, keep in mind that when replacing your trailers axle, this would be the time to get a fresh and new Galvanized Trailer Hub or Trailer Bearing Kit to have a fresh Hub or set of bearings to mount to your new trailer axle. Keep in mind the need for Trailer Grease as well when re-packing your trailer hubs or bearings. In most cases as a result of corrosion, the Trailer Lug Nuts and Trailer Dust Caps would be needing replacement as well. When you are inspecting your suspension system, take a look at your log nuts to see if the surface rust or corrosion will make them damaged after removal. In many heavy marine environments, the surface of the lug nuts can become rusted to the point of rounded when a lug wrench is applied to them. We have these Lug Nuts in Solid Stainless Steel to prevent this issue permanently. Bias Ply or Radial Trailer Tires? 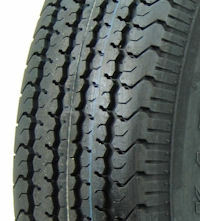 Bias Ply Trailer Tires: Designated by D in your Tires description. For Example, ST205/75 D14. Notice the D, this is is not the Load Range of the Tire, the Load range is noted elsewhere on the Tire. This stands for Diagonal, meaning the Nylon plies in the tire run Diagonally throughout the tire tread. Bias Ply tires are not like steel belted Radials in that they are more flexible. However, this flexibility does not sacrifice strength of Sidewall. Especially with Kenda Loadstar Bias Ply Tires, these tires feature very strong sidewalls, a major necessity, given the environments to which this tire is used. Major uses for Bias Ply Trailer Tires : Boat Trailers, Landscaping Trailers, Utility Trailers, Equipment Trailers, and Cargo Trailers. Generally speaking, Bias Ply Tires are majority in town, short distant type trailer tire, but perfectly adequate for occasion highway use. This is your everyday hard worker, as well as your weekend trip trailer tire. Major Advantages of Bias Ply Tires: Price, Durability, Sidewall Strength, Ability to handle variable air pressures without permanent deformation. Loadstar Brand Bias Ply Trailer Tires have significantly more tread depth with better material compositions as well. Radial Trailer Tires: Designated by R in your tires description. 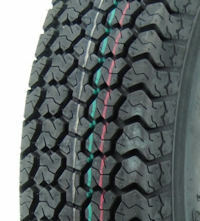 For Example, 205/75 R14. The Radial refers to the Steel Radial Belts within the tires tread. Radial Trailer tires posses a stronger ability to handle higher speeds do to the steel belts within the tread. Also, the flatter profile yields increased ground contact and a stronger road foot print. This quality provides a smoother and straighter tow. Kenda Loadstars Radials are top of the line in their quality of construction and durability. Major uses of Radial Trailer Tires: Cargo Trailers, Equipment Haulers, Rv's and Campers, Toy Haulers, and Boat Trailers. Trailers that are towed a majority of the time at highway speeds from location to location. Major Advantages of Radial Trailer Tires: With steel belts, radial trailer tires feature a strong and resilient tread platform. In addition, because of the flatter tread profile of the radial, the increased foot print of the tread yields more ground contact. This increased contact provides a more steady and straight tow. Also, just as with vehicle radials, Loadstar Radial trailer tires will last longer when towed at higher temperatures due to the strong steel belts within the tread creating minimized tread wear versus the bias ply. -As a result of the simplified engineering of a Disc Brake Caliper, their are significantly less parts associated with its construction. In addition, these parts are specifically designed from materials that resist corrosion, meaning less maintenance and replacements of parts. -Disc Brake Calipers will last significantly longer, especially when used in Marine environments. With Kodiak and Deemax providing Dacromet and Stainless steel, these products are intended to be used in heavy saltwater environments, where Drum Brakes would still succumb to quicker corrosion due to the components not being as protected. Overall the decision depends upon your desire to replace parts, or replace a whole system if you currently operate drum brakes, and are needing replacement parts. In addition, your towing environment is an important factor. In all freshwater applications, where salt content in the water is very low, and towing on salted roads is minimal, drum brakes will not succumb to the corrosion they would experience in marine environments. Switching to disc brakes requires making several changes to your trailers brake system; but, these costs will pay for them self in performance and longevity.